Frame a double degree or include your graduation photo side by side with your degree. These landscape frames come in a range of styles so browse our product range and select an option that best suits your achievements. Embassy frame style showcasing your degree and graduation photo or double degrees Highly polished..
Embassy frame style showcasing your degree and graduation photo or double degrees. Highly polis.. 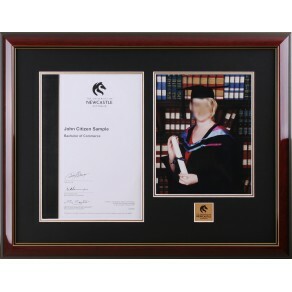 Majestic Gold frame style showcasing your degree and graduation photo or double degrees. Highly.. 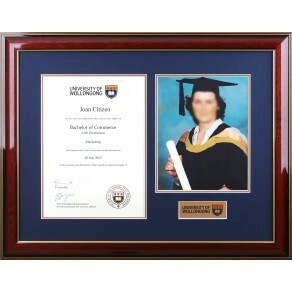 Majestic Satin Gold frame style showcasing your degree and graduation photo or double degrees. ..
Prestige Gold frame style showcasing your degree and graduation photo or double degrees. Highly.. This frame combines your university degree together with your graduation stage acceptance hand shake..